On May 9, the daily mean concentration of carbon dioxide in the atmosphere of Mauna Loa, Hawaii, surpassed 400 parts per million (ppm) for the first time since measurements began in 1958. This is 120 ppm higher than pre-industrial peak levels. This unfortunate milestone was widely reported in the media. There's another milestone that looks even more threatening than the above one. On the morning of June 16, 2013, methane levels reached an average mean of 1800 parts per billion (ppb). 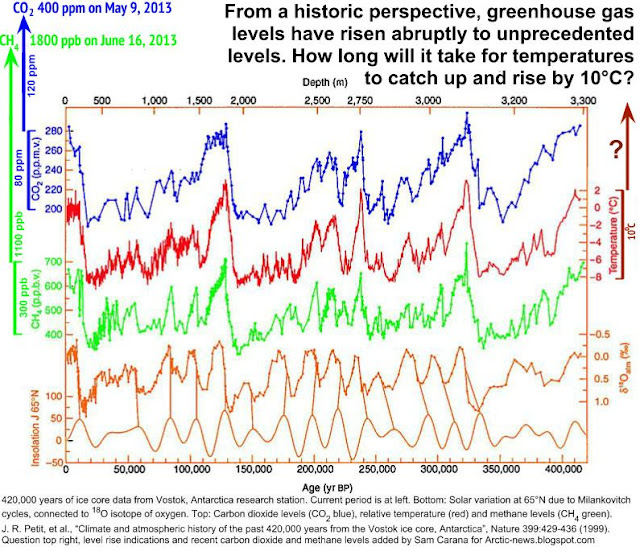 This is more than 1100 ppb higher than levels reached in pre-industrial times (see graph further below). 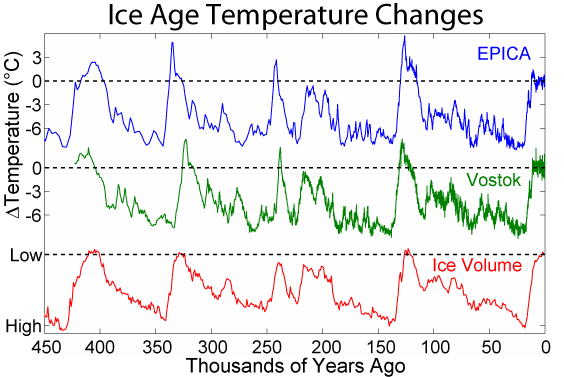 Vostok ice core analysis shows that temperatures and levels of carbon dioxide and methane have all moved within narrow bands while remaining in sync with each other over the past 400,000 years. Carbon dioxide moved within a band with lower and upper boundaries of respectively 200 and 280 ppm. Methane moved within lower and upper boundaries of respectively 400 and 800 ppb. Temperatures moved within lower and upper boundaries of respectively -8 and 2 degrees Celsius. From a historic perspective, greenhouse gas levels have risen abruptly to unprecedented levels. While already at a historic peak, humans have caused emissions of additional greenhouse gases. There's no doubt that such greenhouse gas levels will lead to huge rises in temperatures. The question is how long it will take for temperatures to catch up and rise. 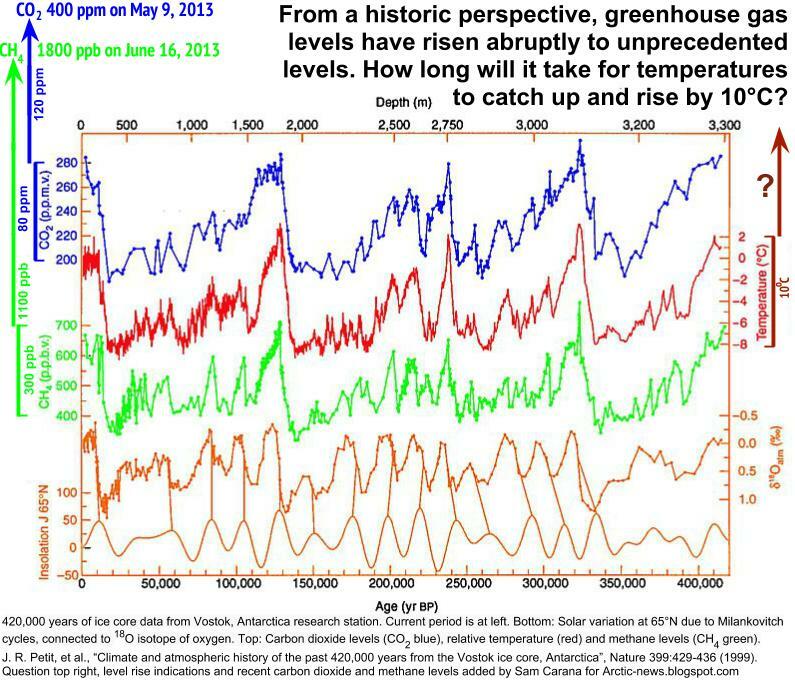 Below is another way of looking at the hockey stick. And of course, further emissions could be added as well, such as nitrous oxide and soot. Large releases of methane must have taken place numerous times in history, as evidenced by numerous pockmarks, as large as 11 km (6.8 mi) wide. methane release typically took place gradually over many years, each time allowing a large release of methane to be broken down naturally over the years before another one occurred. Where high levels of methane in the atmosphere persisted and caused a lot of heat to be trapped, this heat could still be coped with due to greater presence of ice acting as a buffer and consuming the heat before it could escalate into runaway temperature rises. 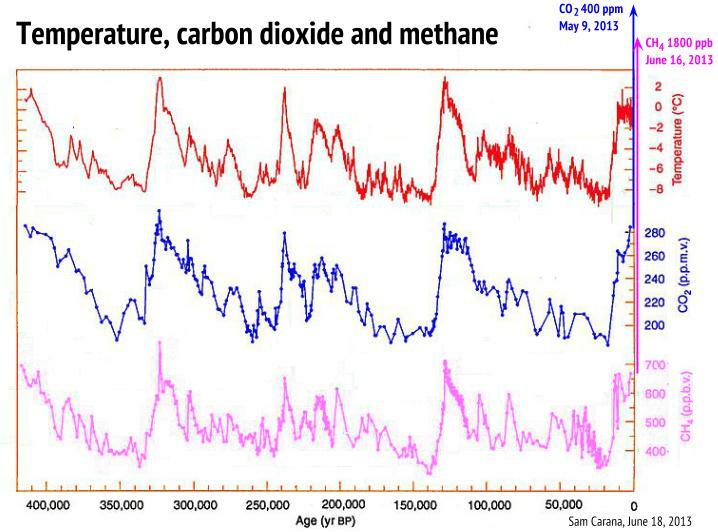 The problem with ice cores is that if there is too sudden methane surge, then the climate warms very rapidly. This then results the glacier surfaces melting away and the ice core begins to loose regressively surface data if there is too much methane in the air. Because of this, there has been previous occurrences of high methane, and these were instrumental to bring the ice ages ice sheets to end (Euan Nisbet's Royal Society paper). The key to this is to look at some key anomalies and devise the right experiments to test the hypothesis for methane eruptions as the period to ice ages. 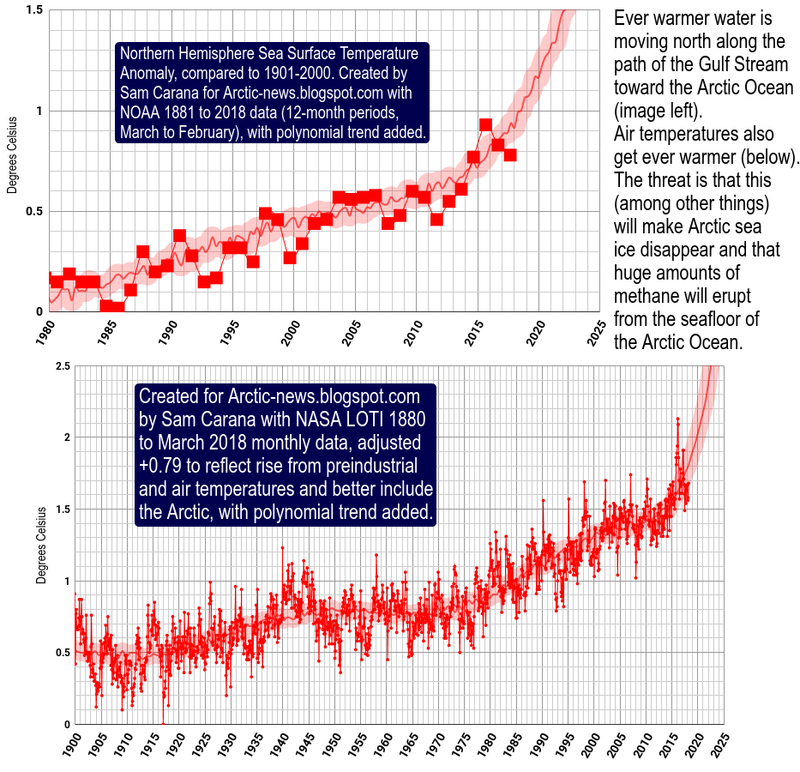 Thus, the current methane melting and 1800 ppm rise is nothing new except that there are no huge Pleistocene glaciers to cool the Arctic Ocean if methane goes to overdrive this time. In fact methane may have been many times higher than that but all surface ice kept melting away and staying regressive until cold water and ice from destabilised ice sheets stopped the supply of methane (it decays fast if supply is cut and temperatures fall back rapidly when seas rose). The Laurentide Ice Sheet alone was equivalent of 25 Greenland Ice Sheets and the Weischelian and other sheets on top of that. So, the glaciers do not act the same way as fireman to extinguish methane. Runaway global warming is now possibility if the Arctic loses its methane holding capability due to warming. 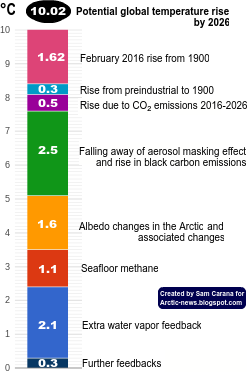 the much overlooked fact that if there were ever very highly elevated concentrations of air in the Arctic, this would induce strong melting of glaciers which then lack those surface depositions where the air were most CH4 and CO2 laden. Even moderate levels of temperature rise damaged Larsen A, Larsen B, Petermann and Ellesmere glaciers. If huge runaway outgassing came out when Beringia flipped into soil warming, then methane came out really large amounts with CO2. Discussion of the experiments how to compensate for the possible lack of "time" in methane elevated periods in the ice cores by alternative experiments to obtain daily, weekly, monthly and yearly emission rates of CH4 and CO2 from the Last Glacial Maximum to the Holocene Thermal Maximum (as daily, weekly, monthly, and yearly sampling of air). Editor's update: Methane levels go up and down with the seasons, and differ by altitude. As above post shows, mean levels reached 1800 ppb in May 2013 at 586 mb, according to MetOp-2 data. Note that IPCC AR5 gives levels of 1798 ppb in 2010 and 1803 ppb in 2011, as further discussed in later posts such as this one. Also, see historic data as supplied by NOAA below. Mankind better find the bravery needed to tackle a worthy foe in a showdown now which involves change. So Barack ran on Be the Change slogan- where is it? These levels of CH4, either we slow and reverse them or Earth is shifted to uninhabitable. Fast..
Sam (or anyone), is there any chance that these leaks are new, not newly discovered? I did write earlier about methane venting off the east coast of North America, due to a warming Gulf Stream. This now appears to be happening at numerous places. It's quite worrying. Thanks for telling me, Gail. Every morning, the millions of human beings who drive cars, thinking themselves prosperous above others, automatically decide the multi-step process to pump more pounds of CO2 into the atmosphere. You could do a mortality extrapolation that says the typical driver will eventually kill 5-10 other humans who don't drive, via the effects of this imposition on final food-producing ability in a damaged climate. In the 1950s, my parents used to go for a "Sunday drive" in the diminishing New Jersey countryside. They, and other "adults", threw wrappers, burger remains, soft drink cups, and empty cigarette packs (not just the butts) out the windows of their cars. The roadways were filthy with their garbage. This was acceptable behavior, as "everyone did it." Until it wasn't. Oh, and black folk had to drink from separately-marked water fountains, use separate bathrooms (if any existed for them) and ride... well, you know the rest of it. The personal automobile must become as unacceptable -- and very SOON -- as littering, smoking in public spaces, and racial segregation. All urban public transit must be made free, from whatever source of subsidy available, with the intention of collapsing new auto sales as rapidly as possible, and phasing out the existing fleet of used autos. The economic efficiencies of this change will more than pay for the cost of subsidy. Some of those active in Brazil this week are trying to reach the goal in their Movimento Passe Livre, although I am not sure if they have a climate objective in that. There are many "carrots" and "sticks" that may be used to move people from one mode of transport to the other, and quickly. I hope those reading this will imagine -- and implement -- whatever means necessary to accomplish this. Hi Joel, I advocate rapid electrification of vehicles as part of a comprehensive and effective climate plan. Electric cars are clean when powered by clean energy, and can be complemented by (electric) high speed rail for long-distance travel. Electric cars are fun. Mag lev evacuated tubes are best! I still dig the good ole mountain bike for under 20 mile journeys.
" large methane releases in the past did not result in runaway global warming"
Whoa!!! Where did you get that. associated with large methane increases and VERY warm periods. Basically, the ocean anoxia was caused by runaway heat, that caused the shutting down of the ocean conveyor, so no oxygen was brought to the depths. 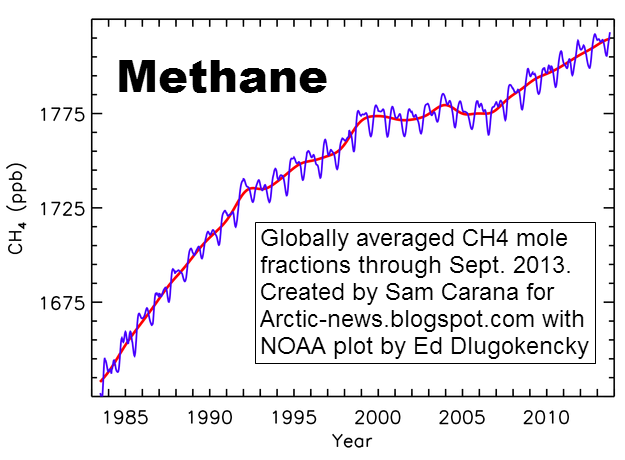 Do you still maintain that methane releases are not associated with runaway global heating? I'm convinced there is a strong link between methane releases from hydrates and runaway global warming, but perhaps I should rephrase that sentence to clarify that further. I was merely highlighting that large methane releases now could be even more damaging than before, given that current greenhouse gas levels are already very high to start with, that Arctic sea ice is getting smaller fast, that climate change is occurring very rapidly and that the temperature rise in the Arctic appears is accelerating, etc.